Deep in my heart I do believe. Popularized during one of the most tumultuous periods in American history, this protest song was a central anthem in the struggle for freedom and equality known as the Civil Rights Movement. If you’ve ever attended a Sunday Celebration at GLIDE, you know this song. 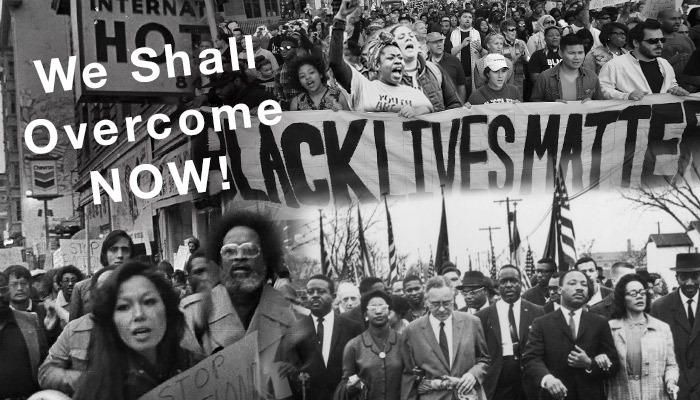 An adaptation of We Shall Overcome is lifted with joy and hope–signaling both the end of Celebration and the beginning of our invitation to go into the world as agents of GLIDE’s mission and values. Compelled to respond to the sufferings in the community, Rev. Dr. A. Cecil Williams and Janice Mirikitani made an adjustment to the lyrics–We shall overcome…TODAY. Rooted in unconditional love, GLIDE’s commitment to take action is an embodiment of the hope engendered in this song. What does “overcoming” look like at GLIDE? Inspired by ordinary people committed to justice, you are invited to join GLIDE as we celebrate Black History Month and the women and men whose radical faith, love, and love inspired social change. Film is a powerful medium for storytelling. At GLIDE, we believe that telling the world our stories can empower us to embrace the common threads which unite our walk towards freedom. Join GLIDE for a special screening of Selma on February 18, 2016. I will be sharing an introduction to this film—reflecting on the triumphs and trials of this historic moment in the Civil Rights movement. Check the GLIDE Facebook page for more event information. There is power in song—power to both liberate the oppressed and to imagine a future with hope. In this spirit, you are invited to join GLIDE on February 25, 2016 for Singing the Spirituals. We will be led by Isoke Femi, Maven of Transformative Learning. Check the GLIDE Facebook page for more event information. Reverberations of We Shall Overcome can be heard in the voices of modern day prophets and protesters who, like Fannie Lou Hamer, are “sick and tired of being sick and tired.” Failed public policies, educational disparities, income inequality, mass incarceration, racism, LGBTQQIA discrimination, and the devaluing of Black and Brown lives are real challenges. Have you ever asked, “Is there hope?” If so, this exhortation is for you: Yes—there is hope! Help us cultivate hope. Today, I invite you to embrace this historic protest song again…with an additional amendment. We Shall Overcome—NOW! Legends of the past…thank you. Legends of the future (You and I)…wake up. Revolution starts at home. Today is the day to take your place in the movement for justice and equality. Wake up everybody!